Important events of 1942, including the battle of El Alamein in North Africa (pictured to the left). 9 Jan Japanese forces start to attack the Philippines. 10 Jan The Allies in the south-west Pacific set up a combined force ABDA (American, British, Dutch and Australia) under the command of General Sir Archibald Wavell. 14 Jan In Europe the battleship Tirpitz moved into Trondheim, Norway, as Germany reinforces the Arctic Convoy routes. 15 Feb After just 7 days the “Impregnable Fortress” of Singapore surrenders to the Japanese. In what Winston Churchill describes as the “worst disaster” and “largest capitulation” in British history, around 80,000 Commonwealth troops are taken prisoners of war. 19 Feb Several weeks after Japan had joined the war, 135 Japanese aircraft attack Darwin in northern Australia. 240 people are killed. The was the first and largest of almost 100 air raids that Australia would endure during 1942-43. 27 Feb Battle of Java Sea – a failed attempt by the Allies to stop the Japanese attacking Java. 8 March Dutch East Indies surrenders unconditionally to Japanese forces. 12 March Douglas MacArthur, under orders from Roosevelt, leaves the Philippines for Darwin, Australia. 17 March Three US fighter squadrons arrive in Darwin and the Japanese attacks on the city decrease. 20 March The German all-out aerial assault on Malta starts. Over 800 aircraft of the Axis Air Forces are launched against 140 aircraft defending the island. The following month would see the people of Malta awarded the George Cross for their heroic struggle against enemy attack. 9 April Allied forces at Bataan surrender and the Philippines fall to Japan. 78,000 Filipino and American prisoners of war are forced on the 65 mile Bataan Death March. 18 April 16 B-25 bombers, launched from the US aircraft carriers Hornet, carry out the first air raids on Japan. Although damage to the intended military targets was modest, the raid was deeply embarrassing to the Japanese high command. 20 April 47 Spitfires are sent to Malta but almost all are destroyed on landing. 8 May The Battle of Coral Sea ends in what is generally considered to be a victory for the US fleet. The action was the first time aircraft carriers had engaged each other with neither side’s ships ever sighting each other. 4 June US forces defeat the Japanese in their attempt to capture Midway Island. 10 June The massacre of Lidice – a Czechoslovakian village ceases to exist, under the direct orders of Hitler. 21 June Tobruk captured by Rommel’s Panzer Army Afrika. Churchill called the defeat a “disgrace”. 35,000 Allied troops are surrendered and Rommel is promoted field-marshal. 25 June As a result of the fall of Tobruk, General Auchinleck takes over direct command of the British 8th Army in North Africa. 27 June Convoy PQ-17 sails from Iceland for Archangel, it includes 33 merchant ships. 28 June 7,000 prisoners from the 8th Army are captured by Rommel. 4 July Convoy PQ-17 is attacked by German torpedo-bombers and dive-bombers. Two merchant ships are sunk and two more damaged. The Admiralty give the order for the convoy to scatter. 5 July Germany launches an all-out assault on Convoy PQ-17. 10 July Only two out of the 33 ships reach Archangel. More will arrive in the following days. A total of 23 merchant ships carrying 430 tanks, 210 planes, 3,350 vehicles and nearly 100,000 tons of cargo remain missing. 7 Aug Americans land at Guadacanal. 13 Aug General Montgomery gives a private speech to Eighth Army officers before El Alamein. 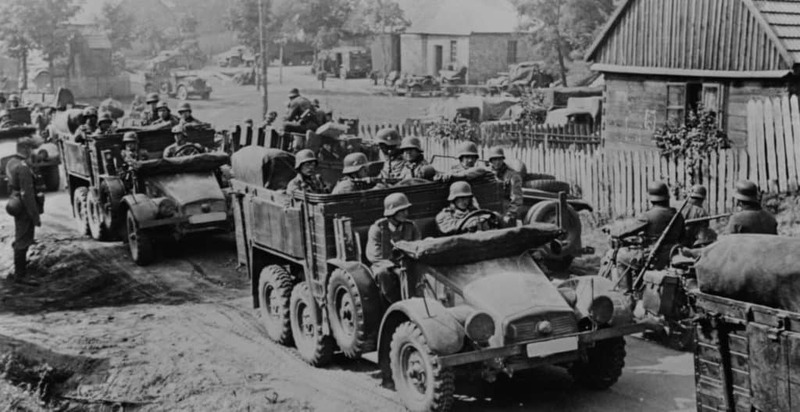 23 Aug The German Army reaches the banks of the River Volga in Stalingrad. 25 Aug Heavy Russian fighting halts the German advance in Stalingrad. 13 Sept The Japanese launch a major offensive against the Americans at Guadacanal but sustain heavy casualties. 23 Oct British forces attack the German army at El Alamein in North Africa. 4 Nov The German army in North Africa is in full retreat, after suffering a comprehensive defeat at El Alamein, Egypt, at the hands of the British 8th Army under General Bernard Montgomery. 8 Nov The start of Operation Torch – the Allied invasion of North Africa. Allied troops land near Casablanca, Oran and Algiers. With a large Allied army in the west of North Africa and with Montgomery advancing from the east, Rommel is caught between two major forces. 24 Nov After weeks of heavy fighting the Russians launch an attack that encircles the Germans at Stalingrad. 12 Dec The Germans launch Operation Winter Storm to relieve their army in Stalingrad. It fails after 11 days, leaving the VI Army trapped. 31 Dec The Japanese plan to withdraw their troops from Guadacanal after suffering heavy losses in a number of battles.